Meadowlark approached Scott after he had dismounted. "You're riding my pony," she declared in a threatening voice and stood with a hostile hands-on-hips posture face-to-face directly in front of him. He was startled! How to respond to this angry girl? "Gosh! I wouldn't have ridden the pony if l knew you'd be upset. Your brother, Swallow, said it would be okay." "Well it's not," she retorted angrily. "No one rides my pony without asking and me saying so." This is Bernie Keating's ninth book. His eclectic writing pursuits include books on frontier history, religion, music, economics, science and two novels. 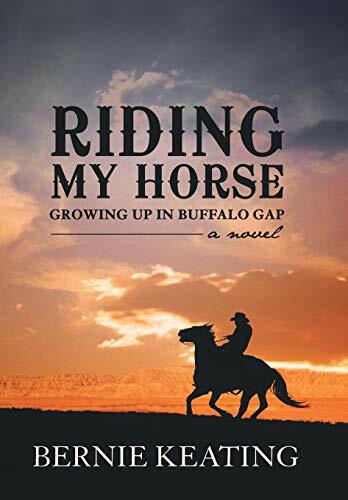 He was raised in Buffalo Gap, South Dakota, the setting for this novel. In his youth he had the aspiration to become a cowboy and ride the open range; however, as an adult he became an executive with a major multi- national company and rode airplanes around the world. In a throw-back to his youth, he and his wife now live on a ranch in the Sierra Mountains near Sonora, California, where they raise maverick deer and stray cats.